Oracle co-founder and Chairman Larry Ellison delivers a keynote address during the Oracle OpenWorld conference on October 22, 2018 in San Francisco. Larry Ellison, in what’s become an annual tradition, spent much of his opening Oracle OpenWorld keynote knocking Amazon Web Services, the leader in the cloud services market Oracle has been spending so much energy – and money – to play in. Oracle co-founder at CTO touted allegedly superior performance and lower cost of Oracle’s cloud services compared to Amazon’s. But the extra focus was on security. Oracle’s cloud platform, he said, is protected by “impenetrable barriers” and “autonomous robots.” The barriers guard the cloud from intruders, and the robots are essentially automation of threat detection and remediation. “Autonomous robots find those threats and kill’em,” Ellison said. And by “other clouds,” it appeared, he mostly meant AWS. Amazon’s cloud, Ellison said, puts its cloud control code on the same machines that host customers’ code, which according to him makes the architecture less secure. An AWS spokesperson did not immediately respond to a request for comment. 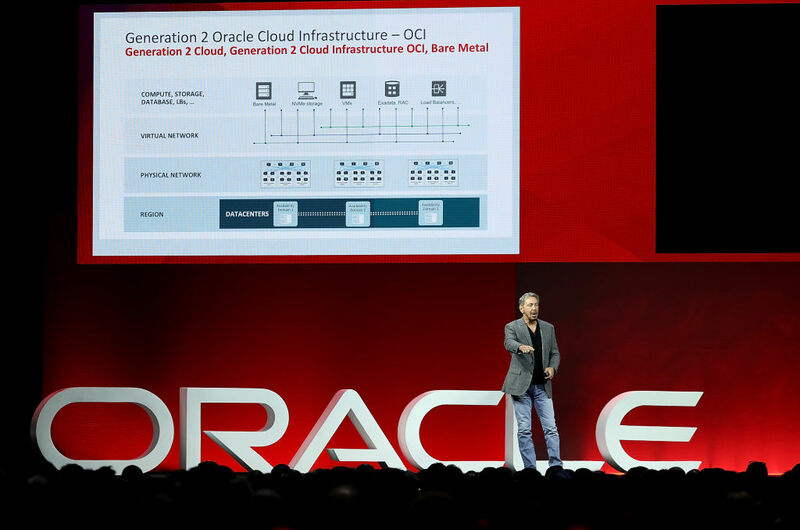 Oracle's Larry Ellison explains the architecture of Oracle's second-generation cloud platform at Oracle OpenWorld 2018 in San Francisco. The security features Ellison highlighted in his keynote Monday in San Francisco are part of the company’s second-generation cloud platform. Called Oracle Cloud Infrastructure, it was designed by many of the engineers who were involved in building the largest hyperscale cloud platforms, such as AWS and Microsoft Azure. OCI was launched in 2016. The company also has a legacy cloud infrastructure, which it launched earlier to support its first foray into cloud infrastructure services. The “dedicated network of cloud control computers” that’s part of the second-generation cloud are a way to separate customers’ data from cloud control software. “We will never put our cloud control code in the same computer that has customer code,” Ellison said. Serving as a barrier, the network surrounds and protects the perimeter of Oracle’s cloud and the perimeter of each individual customer zone to prevent threats from spreading from customer to customer.